With this Two Piece Executive Set, you can store up to 12 of your finest watches AND organize your keys, phone, jewelry, and more in a matching coin tray carry-all. 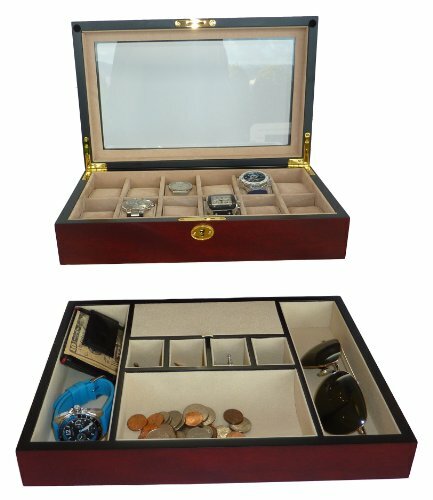 Our 12 piece watch case is ideal for watches, cufflinks, jewelry, and small accessories. The hinged glass lid offers dramatic display for your collection, and the faux suede lining provides a luxury look and feel. All cushions are removable, providing additional versatility. The matching cherry wood valet tray and catch-all is a practical and stylish addition to any desk or dresser and organizes everything from watches, coins, and keys to cellular phone, MP3 players, and other accessories. Enjoy the rich wood tone and practical design. These valet trays are great to place in the bedroom, bathroom, or office. This stunning two piece set makes the perfect addition to any watch collection . . . and the perfect gift for any executive.